OMNEO is an architectural approach to connecting devices that need to exchange information such as audio content or device control. Built upon multiple technologies, including IP and open public standards, OMNEO supports the technologies of today - such as Audinate's Dante - while adopting the standards of tomorrow. OMNEO offers a professional-grade media networking solution that provides interoperability, unique features for easier installation, better performance, and greater scalability than any other IP offering on the market. "It's an exciting time for our industry and for our brand," comments Denis Castanet, Director of Product Management at RTS. "As our comprehensive program of IP-based product launches attests, we continue to be very much focused on providing forward-thinking integrated intercom systems to our customers, rather than just standalone hardware. We see open-platform solutions as an important way forward. Our OMNEO architecture for transport and control represents our commitment to providing the ultimate in flexibility and value for our users - it will evolve in step with new standards and technologies, making it truly future proof. Coupled with the user-friendliness offered by new models such as our ROAMEO wireless intercom system, which integrates seamlessly into existing RTS matrices, our users have the assurance of solid partnership, products, and ROI - today and tomorrow." One of the most recent customers to rely on OMNEO is Ireland's national broadcaster, RTE. Ranking among the oldest continuously operating public service broadcasters worldwide, the broadcaster's radio service began on 1 January 1926, its regular television broadcasts started nearly 36 years later - on 31 December 1961. One of the 23 founding organisations of the European Broadcasting Union, RTE today both produces programmes and broadcasts them on television, radio and the Internet. To ensure a state-of-the-art production environment in its Dublin broadcast centre, Ireland's national broadcaster recently decided that the time had come to replace its aging intercom structure. They chose a tender from Broadcast Video Services (BVS) of Loughlinstown, County Dublin, which recommended an RTS system featuring OMNEO IP technology for the upgrade. "RTS ADAM system has been core to our communications for almost 20 years," notes Dave Matthews, Head of Engineering - Operations for RTE. "Following a procurement process involving all major system providers, the ability of RTS to transition to a new system while maintaining the communications on the old system was a key part of the decision." Managing Partner Michael Joyce of BVS notes that the biggest difficulty was swapping out the old system for the new without disrupting service. Joyce used the RTS Trunkmaster system to address the situation by linking the new and legacy systems together. "The RTS Trunkmaster allows you to have intelligent path-finding between two matrix systems," says Joyce. "If a panel from the old system needs to talk to one on the new system, it will automatically route across a tie line. It basically allows you to create one big intercom from two distinct intercom systems, adapting it as the installation progressed. It's also transparent to the users, which is a big benefit for the client." The basis of the new system is a pair of RTS ADAM digital matrix frames connected to a wide range of keypanels throughout the facility, with 480 ports requiring over 10 kilometres of Cat 6, audio, and fibre cabling. A third-party audio router handles traffic to and from the ADAM system from sources outside the studios. BVS designed and programmed a custom interface to bridge the internal and external components into a comprehensive system, bridging communications both within and outside the broadcast complex. The RTS system installed included two new full-size ADAM matrix intercom frames with fully redundant power supplies. 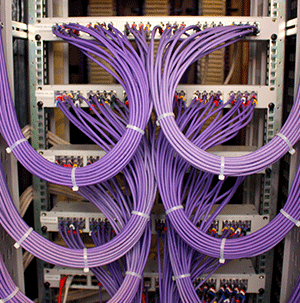 The frames are outfitted with a mix of 27 AIO-16, two OMNEO 64, and one RVON-8 interface cards. The addition of OMNEO IP-technology via OMI card to the ADAM matrix allows distribution of multiple keypanels over a single fibre or IP connection, adding critical flexibility for special broadcast events. Seven GPI-16 interface boxes provide connectivity to the facility's digital mixing consoles. In all, over 30 new KP-series keypanels from RTS were installed. The system supports both current and legacy RTS keypanels, allowing RTE to save money by migrating approximately 100 legacy RTS keypanels to the new system. All microphones and headsets throughout the RTE broadcast centre are also from RTS. "The new system expands on the existing installation very efficiently," notes Michael Joyce of BVS. "Using 16-channel I/O cards instead of 8-channel units, the four ADAM frames in the original system became two frames in the new system. We also ended up with higher capacity due to OMNEO, with the ability to add additional IP connectivity in the future." Dave Matthews of RTE summarizes: "We needed to invest in the latest matrix and control systems while leveraging our major investment in panels. The reliability and flexibility of RTS intercom solutions helps to drive our production across one of the most diverse studio complexes in Europe. All work, planning and installation was handled by BVS, whose knowledge of communications systems in general and of the ADAM digital intercom matrix specifically ensured that we ended up with a great new system delivered on time and within budget."